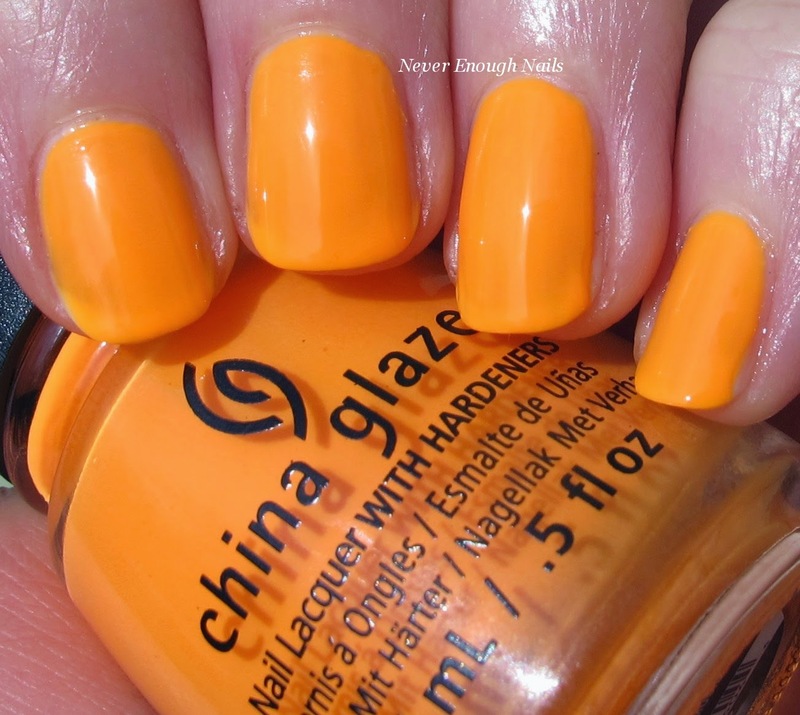 Never Enough Nails: China Glaze Electric Nights Summer 2015 Swatches, Part 1! China Glaze Electric Nights Summer 2015 Swatches, Part 1! It's the most wonderful time of the year- China Glaze neon collection time!!! China Glaze neons are always my favorite neon polishes and I basically live in neon polish during the summer months. They're just so bright and happy in the summer! This year, China Glaze was inspired by the electronic music festival scene and apparently the nine neons in this collection all glow under black light. There are also three glitter top coats in the collection, but I skipped those for now. 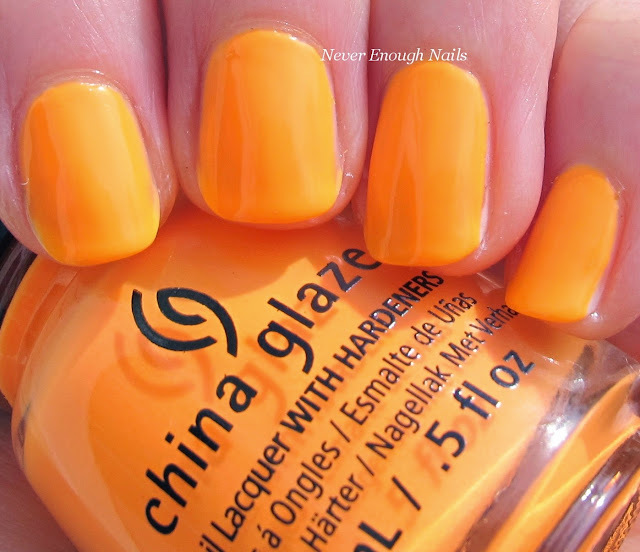 China Glaze Home Sweet House Music is a neon mango creme. 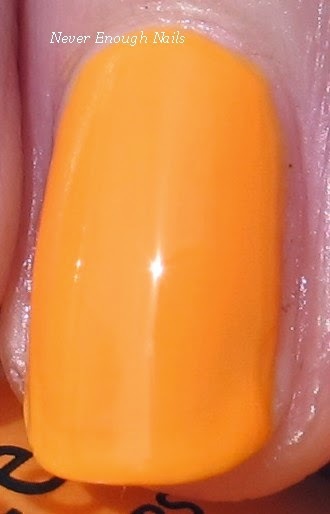 It's an orange with a healthy does of yellow. I love orange polish in the summer and this is just perfect! It's a little different from other neon oranges, as it leans more towards the peachy/yellow spectrum, rather than the red end of orange. This is three thin coats of Home Sweet House Music. I love that a lot of China Glaze's neons do not require a white base to be vivid, cause ain't nobody got time for that in the summer! The formula of this was good. I let each coat dry completely before applying the next one to avoid streaks. It was pretty opaque in two coats, but I did a third to really smooth it out. Like all neons, these dry to a semi-matte finish, so I finished it off with a coat of Essie Good to Go. 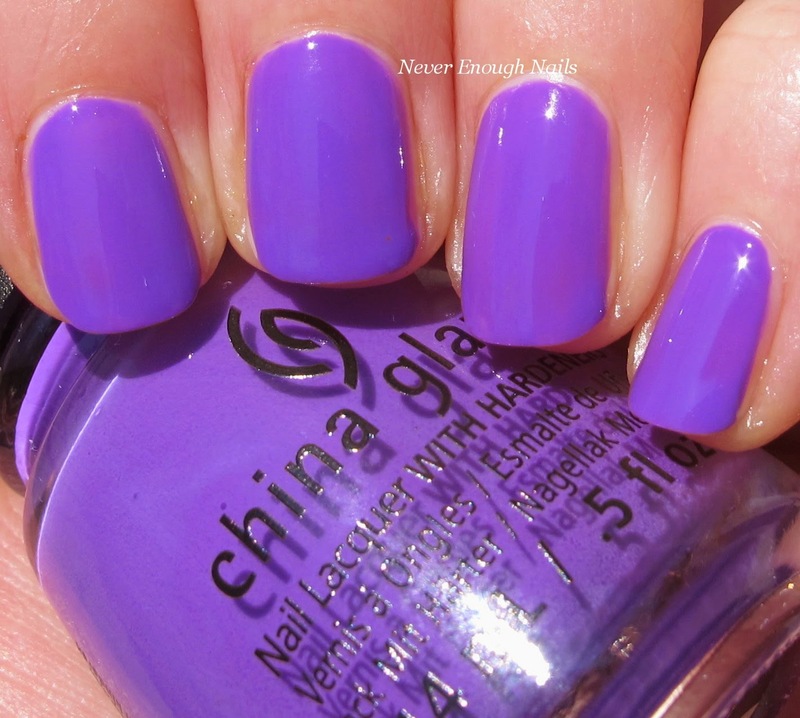 China Glaze Plur-ple is a bright playful blue-purple neon creme. I think it looks a little brighter in my pictures than it did in person and it also looks brighter outside than it does inside. 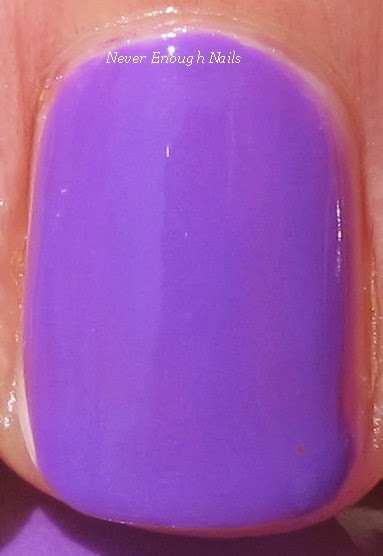 This is a really great purple for summer and I think it's good for people who want to wear a bright without it being radioactive-looking (although I myself love a good radioactive-looking neon, haha). This is two coats of Plur-ple. I did a have a little trouble with applying this one. I wiped the brush off as I usually do, but on my first two nails, the polish came pooling off the brush very quickly and flooded my nails. You can actually see the difference between my first two nails and the second two in the picture below (I couldn't see it until I put the pictures on the computer though). So the first two have two very thick coats and the second two I managed to control it better. Just be aware that you may have to wipe the brush off a lot more than usual. I have some more of the Electric Nights neons coming up for you soon! I love these two and can't wait to wear them to the beach! I purchased my Electric Nights polishes from nailsupplies.us, but they are also available now at Ulta and Sally Beauty.